Did you know that for every $92 you spend on acquiring new customers, a measly $1 goes toward actually converting them? That could have a lot to do with the fact that only 8 percent of people pay enough attention to online ads to actually click on them. That means you have a very tiny margin of error. 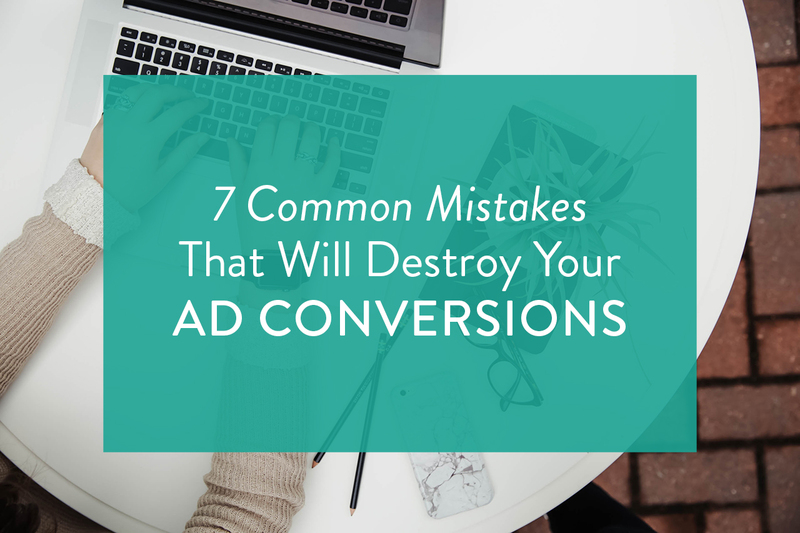 Making a mistake on top of these low odds can make it even more challenging to get conversions. To help you avoid such errors for your own business, here are the top seven to watch for. One of the biggest mistakes business owners make is developing ads and marketing messages based on a faceless audience rather than the human beings they’re actually targeting. In fact, according to a recent report by Nielson, the biggest influencers of trust in advertising are those factors that resonate with human nature, such as humor, value-oriented and real-life situations. When creating ads, focus on speaking the language of your ideal customer and talk about what matters most to them. Words are very powerful. If you’re not paying enough attention to things like bold headings, clear value propositions and strong, compelling calls to action, you are probably missing out on business as a result. Avoid using business jargon and keep your messages short, clear and easy to understand. Use power verbs that appeal to human emotion and create a sense of urgency whenever possible. If you really struggle in this area, consider hiring a writer who has experience in sales copy. You love the many features of your products or services, but to put it bluntly, your audience doesn’t care. What matters to them is what your products or services can do to make their lives better or easier. If you want to capture their attention and get them to convert, you have to appeal to their needs, preferences and pain points and you do this by showcasing the benefits you have to offer. Marketing to your existing audience. If you’re spending a good portion of your marketing budget on social media advertising that targets your existing audience, you probably aren’t going to get much in the way of a return. That’s because most of these people already know you and what you have to offer. Social advertising can be effective if your offers are good enough to entice sharing, but just be careful not to overdo it. Not using social media tools effectively. Social media provides many awesome tools that can help marketers reach and connect with their audiences better, but if you’re not using them properly, things could end up going in the wrong direction. Take, for instance, the time McDonald’s created the hashtag #McDStories with the goal of having customers use it to share nostalgic stories about the brand. Unfortunately for them, they didn’t explain it well enough and people ended up using it as a way to complain about their negative experiences. The lesson? Make sure you totally understand the tools available to you and clearly explain your purpose. In many instances, jumping on a trending news story can be highly effective for a business. But it has to be done correctly, otherwise you risk having the opposite effect. A good example of this is companies referencing global disasters in their marketing efforts. If not done in the utmost of good taste, this approach leaves many consumers to feel as though brands are taking advantage of a tragedy for perceived marketing goals. Such negative reactions can damage brand reputation and result in a loss of business. If you’re not properly testing and tracking how your ads are performing, you could very well be wasting money in the process. Marketing and advertising is as much of an art as it is a science. Something as simple as using a different color scheme or changing just one word can mean the difference between a scroll and a click-through. Make sure you are regularly measuring each campaign and don’t be afraid to test new things until you get the results you’re after. Do any of these mistakes sound familiar? If so, you’re not alone, and more importantly, there’s no need to panic. Simply take a step back, reassess your approach and move forward more strategically keeping the above advice in mind. Over time, you will begin to see your advertising results take a turn for the better.